What are Swaddling Blankets Used For. Is Swaddling Safe and How to Do it. Many new moms do not have a clue what swaddling blankets are used for or how to use them in a safe manner much less how to make one. Learning to swaddle gets the credit for helping my family to get many hours of much needed sleep when our little colicky princess was a newborn. Swaddling for colic is a tried and true method for comforting a little one transitioning from the snug and cozy environment of mom's womb to the harsh lights and sounds of the outside world. Many experts believe that if parents choose to swaddle a baby that it may make a baby feel more secure and therefore less fussy. But, truth be told, at first sight swaddled babies seemed "restricted" and the question lingered as to whether or not the practice is safe. Do blankets leaving them room to breathe? Should newborns be swaddled with arms in? Arms Out? This page will help to address concerns and assist new parents in compiling a list of questions for their pediatrician before starting to use swaddling blankets themselves. What are Baby Swaddling Blankets? Go here to see this wrap in many different colors that can be used as a photo prop for baby's first portrait. 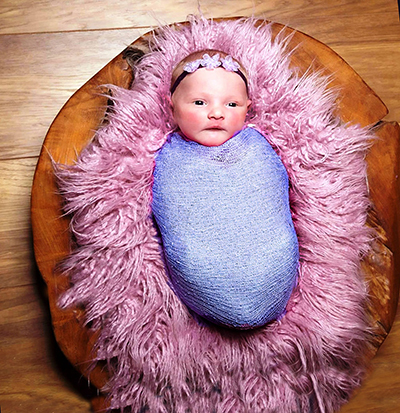 In our house swaddlers are viewed as soft, snuggly little secrets that help sleep deprived moms who need help to maintain their sanity and keep free from anxiety while dealing with an extreme case of colic. Another description would be a blanket made out of soft, thin fabric that can be easily wrapped comfortably around a newborn's body to help her feel secure and safe in new surroundings. Practice with a baby doll until you feel comfortable with the process as demonstrated here. Some babies seem to sleep best with their arms down and wrapped inside the blanket. Others seem to enjoy having their arms and hands free. If your baby seems more relaxed with her arms outside the swaddle, simply do the wrap below her arms. 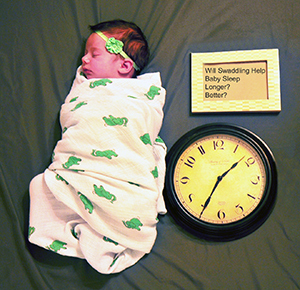 Does Swaddling Help Baby Sleep Longer? Better? Many feel that baby swaddling blankets imitate the snug atmosphere womb where she felt safe and protected. This feeling of security may help newborns to relax while feeling warm and comfortable. Another reason that swaddling might help baby sleep longer is that some infants have an acute startle reflex that causes them to wake them at the slightest noise. The swaddle blanket helps to prevent this. Many mothers wonder how long you should swaddle baby. The answer is that your child will probably let you know by her behavior when the time has come to put away the swaddling blankets. Some babies enjoy being wrapped longer than others. However, when your baby starts to be active and kicks the swaddling away this may be an indication that it is time to stop. Usually this takes place when babies are around four to five months old. Baby swaddle blankets have been used for many years and calmed many babies suffering with colic but you should always consult your doctor on matters concerning your baby's care and health. Never cover your baby's face when swaddling as this is a suffocation hazard. The swaddling blanket should be snug, not so tight that it will cut off the circulation to any part of the infant. 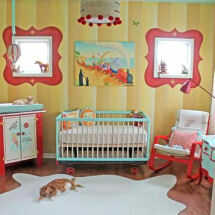 There should be room enough for baby to flex her limbs. Always place baby on his or her back in the crib whether swaddling or not. This may be even more important if your baby is swaddled. Some studies have indicated an increased risk of SIDS and accidental suffocation if swaddled babies are placed on their stomachs. Carefully monitor your swaddled baby at all times since she might roll onto her stomach or the blanket might work loose and present a suffocation risk. Please refer to the AAP's safe sleep recommendations for more tips to keep sleeping babies safe. Swaddle blankets may need to be avoided during warm weather since overheating is thought to create a risk factor for SIDS. Consider using special swaddling blankets made especially for this purpose as they may fit better than ordinary receiving blankets. Swaddling is primarily used for infants where a sleep sack is often used for older babies who have outgrown the need to be swaddled. Sleeping bags are safer for older babies since most designs allow the baby's arms to be outside the blanket and the garment is unlikely to be pulled over the face. A baby sleep sack is loose and may not have the same comforting effect for a baby suffering from colic. There are any number of websites with excellent information on how to safely and successfully swaddle a baby. Once you do the research and have all the facts you may want to have a friend who is familiar with the practice to go over the steps with you for the first couple of times. After studying up on the practice I learned that as with any practice involving the care of newborns, there are pros and cons. It wasn't easy for me to decide whether this was something that I wanted to do. Luckily, I have a pediatrician that listens without judgment. He helped me to get the information I needed and then went over the facts with me. I am forwarding some of the info I found on this page. It will ultimately be up to you and your infant care professional to make the decision whether or not swaddling is right for you and your little one. Return to Unique Baby Gear Ideas and tips to help you safely care for your newborn.